On moving day you are already going to have a lot of paperwork, and you will be receiving even more as the day wears on -- even more so if you have hired movers or plan on hiring movers. This is precisely why to stay organized you need to keep your paperwork in a safe and easily accessible place. Especially if you plan on deducting your move for work or school purposes come tax time. First and foremost, keep all your moving paperwork in one organized location such as a folder. This way if you are called upon to find something related to your move it will all be together in one place. Consider investing in a sturdy file folder or other enclosed options. Of course, this tactic is also slightly detrimental because if you misplace or lose the folder you will be missing all your paperwork. Since all your paperwork is bundled in one place, you need to be particularly careful about where you put it. 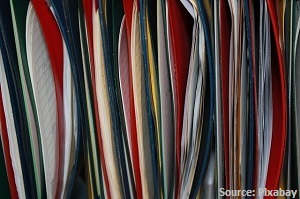 You should also consider making copies of each document in case you are worried about misplacing your entire folder. TIP: To help you remember where you left your paperwork, do something memorable or outside of the norm while putting it in that location. If you forget what you did with it, simply remember the strange thing you did while putting it down. It's a memory trick that really works. Chances are you will need to add to and take out your moving paperwork throughout your move, so in addition to placing it somewhere safe, it also needs to be put somewhere that is easy to access. Again, the glove compartment in your car would be a prime location (mostly because it locks) or if you prefer somewhere inside your home the top of your refrigerator is both easy to get to and somewhere no one would think to look for valuables. Utimately, to keep your moving paperwork as organized as possible, you need to come up with a system that works for you. Assuming it's an organized system you can keep track of, this will be one less thing to worry about during your move.